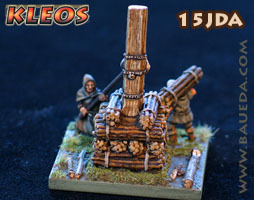 15mm Joan at the stake AVAILABLE NOW! This little vignette is designed to represent the Maid of Orléans (and as such would be suitable for a Burgundian army camp! ), but can of course be used for any burning at the stake of young female prisoners you prefer... As a form of capital punishment, burning has a long history as a method favoured for crimes such as treason, heresy, and witchcraft and fell into disfavour among governments only in the late 18th century. The pack include a resin pyre and a matching pewter female figure chained to the stake, which are fairly generic and can be used for most historical periods. Two other figures complete the set, both being very specifically western medieval, one is a servant carrying yet more wood for the pyre and the other a priest wielding a cross mounted on a wooden shaft. The complete scene is designed to fit on a standard 40x4mm baggage base. 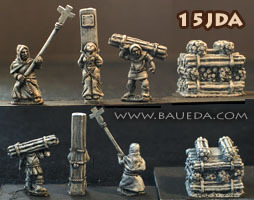 15JDA is available only as plain cast. We regret at the moment we are unable to offer this item as a stock finished element.